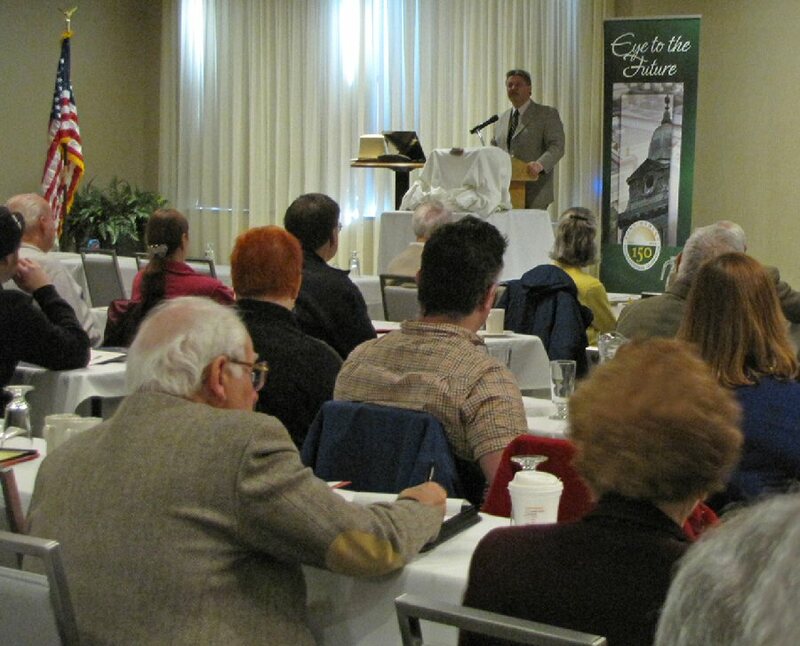 OSWEGO – The Oswego War of 1812 Symposium returns to the Port City for its fourth year. Once again, it includes a full commemoration weekend of this historic war that secured America’s independence and earned the young nation worldwide respect. Dr. Timothy Abel, historian and adjunct professor of anthropology at Jefferson Community College and SUNY Canton, returns to the Oswego War of 1812 Symposium with a presentation about the archaeology of Col. Pike’s Cantonment. He is pictured here during an active discussion with a curious audience from last year’s event. The event runs from April 4 to 6 at the Lake Ontario Event and Conference Center, 26 E. First St., Oswego. Fort Ontario State Historic Site Superintendent Paul Lear is the chairman of the Oswego War of 1812 Symposium Bicentennial Steering Committee and will emcee the event, assisted by Jenny Emmons, curator at Fort Ontario State Historic Site. The symposium has grown significantly from its inception, and this year is no exception. A new component leads off the event as SUNY Oswego students take to the podium to participate in a presentation competition. From 6 to 8 p.m. on April 4, attendees enjoy a variety of perspectives about the War of 1812 from these budding historians. An awards ceremony immediately follows, hosted by Dr. Gary Gibson, chairman of the student presentation committee and Dr. Richard Weyhing, professor with the SUNY Oswego History Department. Early registration also takes place from 6 to 9 p.m. on Friday, followed by a meet-and-greet social with cash bar. This year’s seminar is sponsored by the Friends of Fort Ontario, Sackets Harbor Battlefield Alliance, Oswego County Tourism Advisory Council, The Lake Ontario Event and Conference Center, Pathfinder Bank, SUNY Oswego Office of Business Relations, IHeartOswego, The Palladium-Times, H. Lee White Marine Museum, Man in the Moon Candies, WCNY-TV, Dot Publishing, Oswego County Today, City of Oswego, and the Oswego County Department of Community Development, Tourism and Planning. Registration for both days is $75 per person or $35 for students with a valid ID. The registration fee includes Saturday’s lunch, refreshment breaks on Saturday and Sunday and workshop materials. One day registration is also available: $50 for Saturday, including lunch or $25 for Sunday. Contact Lear at 315-343-4711 for credit card payments Monday through Friday, from 10 a.m. to 5 p.m. Checks should be made payable to “Friends of Fort Ontario – 1812” and mailed to the Fort Ontario State Historic Site, 1 E. Fourth St., Oswego, N.Y. 13126.